Today’s transition of power means the White House website is undergoing a few transitions of its own. We’re approaching two hours after Trump officially became our 45th President, and his transition to the White House has already led to change — to the official White House website. Gone are all mentions (sitewide) of climate change. Also missing is the former LGBT rights page, which now redirects to an opt-in form to receive the Trump newsletter. I want to chalk this up to a transitional mistake, but the deletion of all mentions of climate change isn’t as simple to explain away as a page that once had Obama’s face on it. The latter seems a logical removal that could be re-added once staffers change it over to feature President Trump. Although you have to wonder why it wasn’t done in the weeks leading up to the change of power. After the transition of power this morning, the Obama White House website was archived (as was his Twitter account), and replaced with a newly-created version for Donald Trump. Trump’s version, unfortunately, doesn’t contain the LGBT page, or any mentions of climate change. Before jumping to conclusions, we’re not sure this removal was because of policy or oversight and we don’t mean to insinuate that Trump himself was involved — we simply don’t know. For now, we merely know they’re gone, not why. 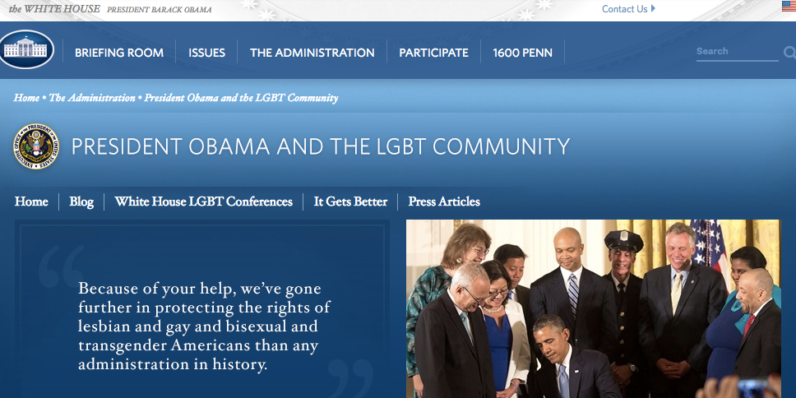 Obama originally added the White House LGBT page to document historic achievements and policy changes for gay and transgender people. It contained helpful links to the “It Gets Better” campaign and and provided resources to those thinking about suicide. Now, it’s gone and we’re not sure if it’ll be coming back. Cross your fingers that this is all part of the transitional process. We’ll update this article as needed.